Michigan rolls past Illinois, 41-8 on homecoming Saturday. Today's meeting between Illinois and number three ranked Michigan played out almost as if it had a script. It was a crisp, sunny October day, and one hundred thousand plus Wolverine fans show up in the Big House to watch Michigan give the Illini a clinic in how to dominate a football game. Michigan racked up 561 yards of total offense on it's way to a 41-8 drubbing of a vastly outmatched Illinois. The offense was balanced, and the defense didn't allow a completion in the entire first half; and limited Illinois to 172 yards of total offense for the game. The defensive play was what's starting to become almost expected. 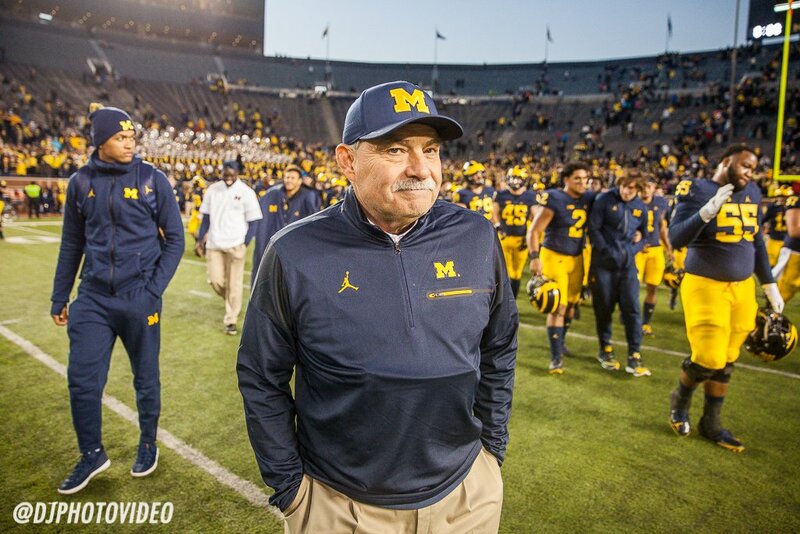 The line got constant pressure on third string, red-shirt freshman quarterback, Jeff George Jr. Who only dared to throw in the direction of Jourdan Lewis once all game. And without one 45 yard run from Ke'Shawn Vaughn, the Michigan defense would have held Illinois to just 33 yards rushing. I think it's safe to say that by halftime, most of the Michigan faithful had already turned their thoughts to next Saturday's trip to East Lansing. The coaches and players maintain that they treat every game, every week as a championship game, which seems to be evident in the consistency of their performances, but I'm sure that October 29th is a date that they've been looking forward to for as long as the fans have. When asked about the upcoming game, and the sting from last year's disastrous ending, Dymonte Thomas just said, "I couldn't wait to get our revenge, and next Saturday we get our opportunity." Speight added, "This isn't a game you have to motivate yourself for, or get up for, this is Michigan, Michigan State." If coach Harbaugh has liked what he's seen from his team in their first seven games of the season, one things for certain, he's going to see what he's liking much clearer with his new specs. He said that he's made the switch "full time" to glasses and added, "This style in particular is a tip of the cap, a nod to Woody Hayes, Michael Douglas in the movie, Falling Down, and also a tip of the cap to Malcolm X." It is definitely clear to see that this Michigan ball club is one of the best in the country.